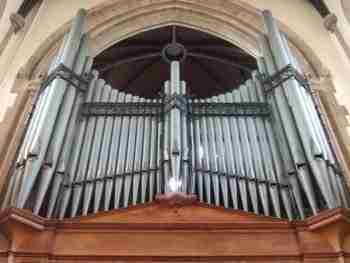 The J W Walker organ at The Sacred Heart Wimbledon is a rare survivor of instruments in Britain. Unlike most of its era, it remains almost unaltered, retaining its original pneumatic action. Until relatively recently, the treatment of an organ retaining its pneumatic action, would have been for it to be electrified as a matter of course. Even at the time of this restoration, electrification was considered and other firms tendering for the work were advocating it. In this respect, attitudes to preservation still lag behind in accepting principles which have been long established in Continental Europe. The restoration of pneumatic actions has its problems. It is certainly not as simple as electrification. It also requires more regular attention and adjustment, not least because the instruments are subjected to much more damaging heating today than they would have experienced when they were built. Setting up a pneumatic action is also more demanding than an electric or electro-pneumatic action. Why then should we bother? There are a number of reasons why we should. Firstly, these instruments are an important part of our heritage. Only if left in their original form can their importance be properly understood and studied. Secondly, the feel that an organist has when playing an original pneumatic action is different from that of a mechanical action organ and far removed from that of an electro-pneumatic instrument. The tactile feedback from an instrument is important in enabling the organist to understand and interpret the music played on the organ. It is an essential part of the performance of the music of any period, but in particular, the music of the period of the organ itself. It may be helpful to draw an analogy here. Nobody would think of removing the boiler of a famous steam engine and installing a diesel engine in its place. Even if the result looked the same and was still able to draw a trainload of railway enthusiasts, it would not be the same. The enthusiasts would simply not be interested and with good reason. The organ was built in 1912. In 1935 and some time later, some tonal changes were made following the musical taste of the time. Five stops were added to the Choir Organ, the Great Organ Dulciana was re-voiced as a Flauto Dolce, the Swell Vox Humana was removed in favour of a Dulciana Twelfth and later still, the harmonic Flute 4 was removed to make way for an Octave 4. Later still, the actions were re-leathered using Perflex, that magic material from America, which promised to oust traditional leather as a material for under-actions. As we now know, the promise turned out to be hollow as Perflex deteriorates rapidly and fails. 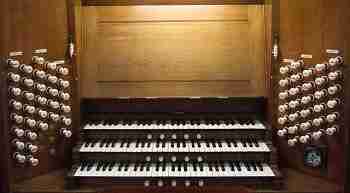 Mander Organs became involved in 1985 when the organ had become all but unplayable. The Perflex was replaced with leather, slider seals were added to the coupler actions and the chests, which had been added in 1935 for the extra stops on the Choir, were removed, because the action was not able to supply them with enough wind for them and the main Choir soundboard to be reliable. This was simply a holding action, to make the organ playable and it did at least ensure that the organ got used and appreciated. Our recent restoration work was more comprehensive. All the tubing was removed and the under-actions re-leathered once more, including the primaries, which had not been re-leathered previously. The console was restored, the soundboards screwed and pegged on site, the bellows (of which there are many) were re-leathered for the first time since 1912 and the organ was cleaned. The specification was also returned to very close to the original with a new Dulciana 8 for the Great Organ and a new Vox Humana 8, modelled on another of the period, was added to the Swell, replacing the Octave Oboe 4. Once the work had been completed, it was discovered that the Pedal derivation machine and pneumatic couplers also needed restoration. It had been hoped this would not be necessary. These elements were returned to the works for a complete overhaul. The restored organ was opened with a recital by David Briggs on the 21 October 2011. 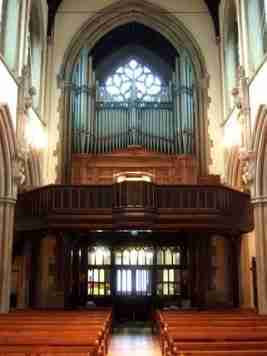 The organ of the Church of the Sacred Heart, Wimbledon, has recently undergone a major restoration by the excellent firm of Mander Organs. Situated high in the gallery at the west end of this remarkable church (which in so many ways feels more like a cathedral), the 1912 J W Walker organ is one of the very finest to have been handed down to us in virtually its original condition. The instrument hails from a particularly successful period in British Organ Building history and the musically the heady combination of opulence and brilliance makes a vivid impact. The tubular pneumatic action has been painstakingly and thoroughly restored by Manders, thus respecting the original concept and also the manner in which this influences the player. It was a privilege to be asked to give the re-opening recital. This is a sensational instrument which deserves to be much more widely known. We enjoyed the challenge of restoring this instrument and learned a great deal as the work progressed. We are pleased that the authorities at The Sacred Heart allowed us to restore the instrument without electrifying it and are happy that future generations, of organ players and admirers will be able to experience a period instrument in almost original condition. We think they will be able to learn much from it. View the Specification of the Walker Organ at The Sacred Heart Wimbledon (completed 2011) and the Restoration Report.